Concerns over the hospital treatment of Rathfriland youngster Stephen McElroy before his death have been raised at an inquest hearing. Sports-mad Stephen was discharged from Daisy Hill Hospital on March 29 2015 but passed away in the facility just six hours later. He then collapsed and died in the A&E department on the Sunday afternoon. At a preliminary hearing in Belfast on Friday 29 April, it was heard that several issues were raised in a Root Cause Analysis (RCA) report compiled following Stephen’s death. A RCA is used by hospitals to identify how and why patient safety incidents happen. They are produced to ensure that lessons are learned to prevent the same incident occurring elsewhere. Coroner Joseph McCriskin was told of the McElroy family’s concerns about the procedures in the hospital on the day Stephen attended. The family believe there was a failure to correctly diagnose Stephen’s condition and a delay in placing him in a cubicle. A lack of middle grade doctors were available, the court was told, and if they had been present, it “may” have led to Stephen being diagnosed correctly. There is some confusion surrouding Stephen’s death. He passed away from a small bowel infarcation, pneumonia and intra-abdominal adhesions but the analysis also cited ischemic entercolitis as a possible contributory factor. 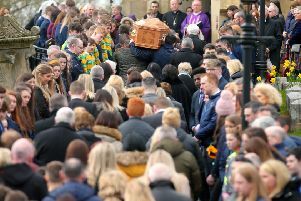 Barrister Thomas Fitzpatrick said that Stephen’s family want an independent expert to look at the case as there was nothing in the report that indicated the proper processes were followed on the day of his death. He said that he was having to ‘piece together’ why Stephen died. Mr Fitzpatrick said it was for these reasons that the family wished for an independent expert. Coroner Mr McCriskin said that his office had ‘limited resources’ but he would discuss with his medical adviser and decide whether an independent expert could assist the inquest. He said that while the family may not get answers to some questions and he cannot attribute blame, if mistakes were made it is important another family does not have to go through what they have gone through. Mr Fitzpatrick said that there were no civil proceedings in relation to the matter as yet. A full inquest into the death is expected to be held in September or October of this year, at the latest.